No, we’re not suggesting celebrating the Canadian holiday; neither are we recommending a new fitness regimen. Instead, the preservation specialists at the Duke University Library have established “Boxing Day” as a monthly routine in their office. During the last fiscal year they boxed 8,500 artifacts! 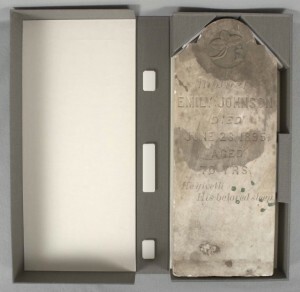 Read more about their Boxing Days and boxing projects (part of a collaborative effort with their preservation partners at the Iowa State University Library). Those of you working in museums may not have the need (or supplies and staff time) to create customized artifact enclosures on that scale. But if you can pool several staff members from you institution or your region to come together and share supplies and techniques, a regularly scheduled Boxing Day may make a lot of sense and be both fun for staff and beneficial for your collection. Included in the Duke staff’s account of their Boxing Day are links to images and descriptions of three artifacts they boxed. One especially impressive project was a box built to house a gravestone. Staff determined that the heavy stone object needed an extra level of support, which a double-thick board base could supply. They also lined the box with volara pads to cushion the piece and keep it from shifting and cleverly built in slots for hands to reach in and lift the gravestone out, if necessary. Another possible technique to allow for removal would have been to build a box that opened via flaps on either short end. Both could be opened and hands could push the stone on one end to slide out the other. A mylar window cut into the top of the box would be less cushioning than the current volara-lined lid but would grant easy visual access to the piece. During C2C’s box-making workshop last month, instructor Anne Lane taught participants how to create side-opening boxes and mylar windows. 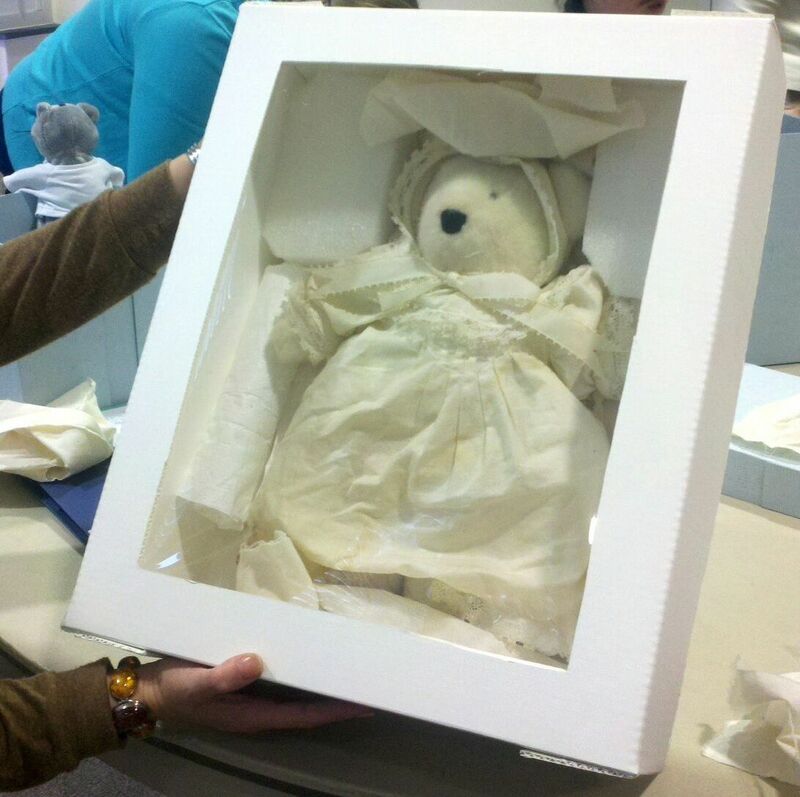 Participant Kim Mozinga, a Museum Studies graduate student at UNC Greensboro, crafted this enclosure for a special teddy bear. The white Artcare board offers an extra level of pollutant-adsorbing protection. 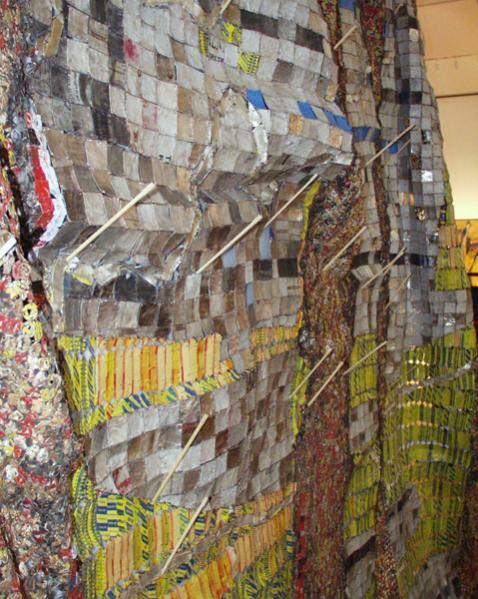 Ethafoam blocks and other padding materials keep the object from shifting inside the enclosure. Poly batting and acid-free tissue cushion the piece and padd out the dress to prevent creasing. The mylar window allows visual access to the object without handling. Do you have a stock-pile of objects that could benefit from customized housing? In addition to blueboard or Artcare board, do you have cutting mats, snap-blade knives, cork- backed rulers, and some padding materials? Do you know of other museum professionals in your region who could bring their own skills, supplies, and special-needs objects to collaborate and work together? Try to gather the resources necessary and schedule a boxing day soon! One of the best things about working with historical primary sources is the sense of intimacy that a researcher can conjure by reading old documents or viewing antiquated objects and imagery. Family photographs and formal portraits occasionally allow the viewer to peek at strangers’ bygone lives in surprising detail. Some photography-based exhibits, both institutional and online, have put innovative designs and themes to use in order to engage audiences. Museum consultant and StEPS trainer, Linda Norris, has two recent blog posts that share ideas about using photographs as the inspiration and centerpieces for engaging exhibits and public programs. 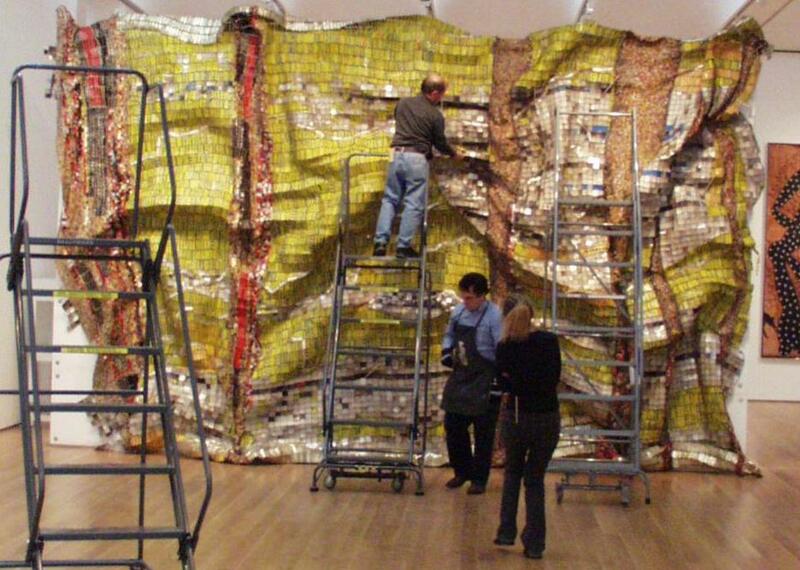 In one post, Norris described an intriguing installation at the Indiana Historical Society. The exhibit used photographs as a kind of window into the past and recreated the setting of each image. First person interpreters in period costume inhabited these tableaus and narrated the photograph’s story. In another photographic exhibit project, a museum solicited submissions of participants’ photographs of their grandmothers. The idea was to gather images of participants’ grandmothers in their youth, not at the ages contributors would have remembered them. Norris submitted her own grandmothers’ pictures for the display, and the emotional exercise of curating her recent ancestors’ photographs nurtured a feeling of personal connection to the project and the institution. Although the Indiana Historical Society’s exhibition would require costly reproduction, installation, and staffing, a young grandmother photographic exhibit is something any state or local historical society could do, and relatively inexpensively. 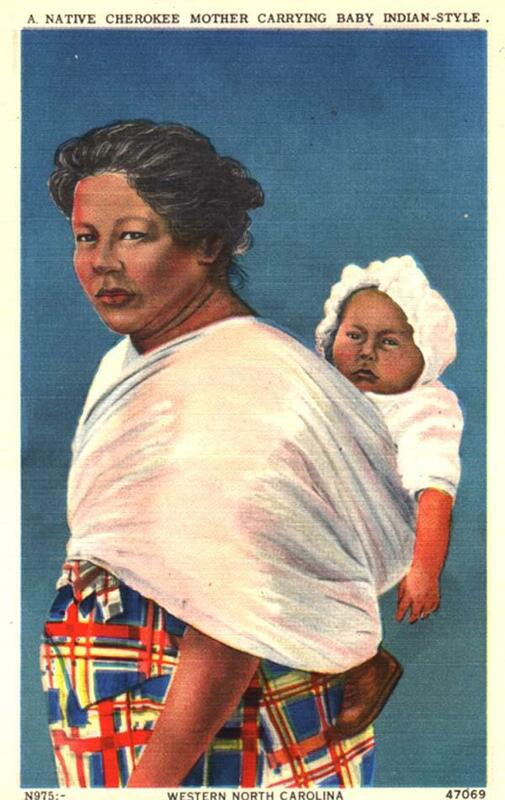 A pop-up museum with the young grandmother theme would be even cheaper and maybe equally as engaging. Another exhibit or programming idea focusing on vintage portraits is “My Daguerreotype Boyfriend,” an online crowd-sourced selection of images of young men, “where early photography meets extreme hotness.” Wouldn’t it be fun to sift through your institution’s photographic archive and select candidates to submit to the site? Or to develop a public program, either by crowd sourcing entries or using your institution’s collection? An NC institution could have a “Vintage Mr. North Carolina” pageant and our State Historic Sites could present several qualified candidates. How about this as a project for Digital NC? Recently, the Center for the Future of Museums posted an article on the “Flawsome” concept of branding. Thanks to IMLS grant funding, we’ve established C2C as the brand of the NC Department of Cultural Resources’ professional development outreach for cultural heritage collections. Our statewide audience/ consumer group relies on C2C training to be full of useful practical information, hands-on activities, and local networking opportunities. Since C2C is a brand, can we apply the flawsome definition effectively to our program? In this pursuit, we’d like to share with you some of the more critical comments from our workshop evaluations, the stumbling blocks they reveal, and ways that we’ve learned from them and/or adjusted our practices accordingly. Clarifying Schedules: “If the leaders could be here a bit early, that’d be great. I was very confused about what I should do.” Last year we had a workshop 3+ hours away (a day trip for us). The workshop was scheduled to start at 9:30, and we didn’t arrive ‘til a bit after 9:00. Some people thought the workshop started at 9:00 and were already there waiting. Since that discombobulated workshop beginning, we’ve made a concerted effort to send all registrants an email during the week before a Monday workshop to remind them of the start time and to let them know that we’ll be driving from Raleigh (usually) that morning and so not to expect us much before 8:30-9:00, depending on the set-up requirements. Varying Knowledge Levels: “more directions for remedial people.” At most workshops, participants have a fairly wide range of knowledge and skills. Keeping the content and instruction both accessible and relevant is a perennial challenge. “Love you guys, but less intro.” We are thrilled to have “repeat customers” at many of our workshops. When we know there will be a high proportion of repeaters in advance, we can abbreviate the introductory presentation on our program. For those who know us well, however, any program overview (which first-timers appreciate) is repetitive. Activities: “More hands-on.” People really learn best by practicing techniques with peer and instructor guidance. Based on feedback, we’ve added new hands-on activities, especially in disaster preparedness workshops. However, unless the entire workshop is hands-on, some participants still can’t get enough. “Include behind-the-scenes tours of museum storage, registration depts, etc.” Occasionally, we can incorporate this great suggestion. Our “Textiles Intensive” workshop during Preservation Week will include this feature. Budgets: “This was a great workshop for new ideas, but hearing about funding opportunities would have really helped.” Many of our tips for preservation supplies and new exhibit techniques cost money. To help address the funding issue, we’ve added some guidance about grants to our website. Workshop Duration: Some participants have wished for multi-day sessions on workshop topics. While we acknowledge that we cram a lot of information and resource suggestions into a day-long session, that still seems like the best in-person model to make the training as accessible as possible. Our staff is always available for individual follow-up consultations, and requests for this service has increased as our program gets more “brand recognition.” Additionally, we created this blog, in part, as a way to provide preservation information that supplements workshop instruction. Supplies: “More table space;” “more workstations.” Sometimes the workshop accommodations are not ideal, but the trade-off is that we are able to reach out to a wide variety of cultural heritage institutions and practitioners around the state. “Provide writing pens.” Our first response was—really? On second thought, sometimes the few pens we bring disappear at our workshops. It might be wise in the future to bring a cache of them along to each one. We hope you agree that C2C is flawsome! And we hope that encourages your participation in our statewide network and/or our online community. How can your institution announce its flawsome-ness? Could this concept translate into a viable strategy to engage potential participants and/or supporters? With plenty of planning and persistence, the dreams you have for your institution can become grant-funded realities. 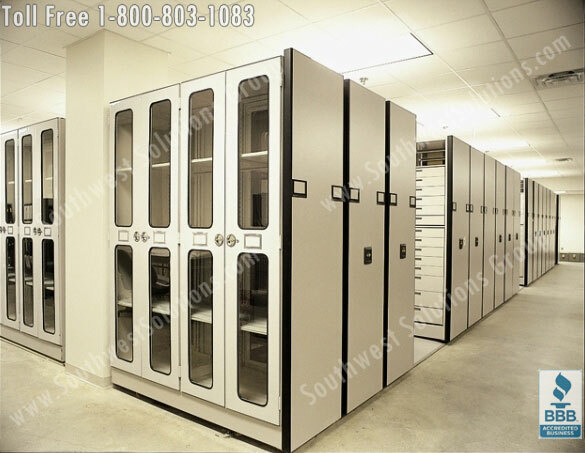 Funded projects are primarily consultations/ assessments, professional training, or storage upgrades. Grants are awarded for projects costing up to $6,000; no cost sharing is required. In the past several years, 40-50% of applications have been successful. Professional consultations are key. If your institution has not yet had an assessment, this grant can be used to fund one. Before considering upgrading storage in any way, you must be able to provide a report written by appropriately trained professionals, prioritizing recommendations for your institution. Small-budget entities within larger umbrella organizations are definitely eligible to apply. Consider collaborations with other organizations in your immediate area. Especially if others have shared needs for professional expertise and training, multiple institutions could work together to make a strong application. Stress the relevance of your collection to the humanities. The application narrative should be five pages and Joffrion recommended devoting at least one page to a description of your collection and its significance for the humanities. Your institution must be committed to making its collection accessible. NEH has become more flexible about requiring a certain number of days the institution must be open to the public. Contact program staff, if your site is open less than 100 days/year and you are interested in applying. A sample successful application from a small museum serves as a good accessibility benchmark. NEH’s online grant guidelines advise that systems will be down at the end of April for several days. Therefore, don’t wait until the last minute to start working with the grants.gov website. All applications must be submitted online, and with the impending technical outtage, make sure you get a headstart. Amy Sawyer, Exhibit Design and Production Specialist for NC Historic Sites, generously shares her wisdom with our C2C audience in this post. 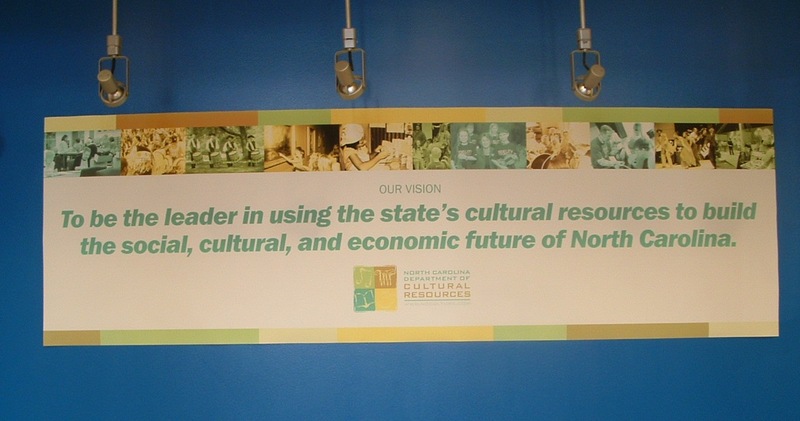 This banner, displaying the NC Department of Cultural Resources’ vision statement, is badly faded. The lettering and grayish photographs in the top border, for instance, used to match the blue background. It’s appearance led our C2C staff to ask questions about materials that affect the longevity of digital prints and recommendations for small museums that contract out for these services. Amy Sawyer supplied some really helpful answers. 1. The first issue is water-based vs. solvent-based ink. Water-based ink is cheaper and better for environmental and health reasons, but solvent-based lasts longer. The water-based is coming along, but we don’t always have access to the best new inks and printers… so we have to use what we have available. I use an older Epson 9600 wide-format printer and Epson Ultrachrome inks – they are very colorfast and have a low-odor solvent base. these are now outdated by better technology, and if I am ever able to replace this printer with a new one I will look into archival quality water-based ink. The printing industry is getting into “eco-mode” finally, so by that time there will be plenty of choices – and data – available! Most desktop printers use water-based ink and the prints will fade within days of sunlight exposure. As far as I know both digital and old-school offset printing can use either type of ink – so the method of printing should not affect lifespan. 2. The second issue is natural paper vs. synthetic print media. I never use paper for museum printing. I use a “vinyl” made by Kodak called “waterproof, self-adhesive, poly poster matte.” It is a photo-quality material made from polypropylene – and has an adhesive on back… so peel and stick. I like “peel and stick” prints since the other options are applying sheet adhesives – expensive and not easy to use – or spray glues… yucky for people and artifacts because of fumes. The Kodak media is formulated for the types of ink and printer I use – but I am not sure of compatibility between printers. There are other printable vinyls on the market that are made from PVC… people should avoid PVC when at all possible due to health and environmental issues that can hasten artifact deterioration. *I have had a print media vendor say that the materials I use are “overkill” for indoor use and I should use something cheaper… but I won’t, and I’ll never use that vendor. Don’t nickel and dime on quality when you need a print to last 20+ years in the varied environmental conditions you find in small museums… many of our small museums have issues with HVAC and lighting – so UV resistant and waterproof are not overkill! They may be considered exterior quality – but would not be good long-term exterior graphics because they will break down after about 5 years in full sun. 3. The third issue is laminate. Yes, do laminate – but not necessarily for UV resistance. I’ve tested Ultrachrome ink on my Kodak “vinyl” outdoors in hot, direct sunlight – and rain and snow- on the roof of our old offices. I laminated only one half of the print with a thick laminate, and left one half bare. After a couple of years there was very little difference in color between the sides – so the Ultrachrome ink does not need lamination to resist fading. I would advise lamination more for protection – my coated paper scratches very easily… so the only time I don’t laminate has to do with budget restrictions, or the graphics can be installed with little effort and are protected from people – like inside a case. There are a variety of grades and types of laminating film – I use 3 mil, 5 mil, or even 9 mil thick depending on the location. I now use an over-laminate which does not contain PVC – it is polyester, but the most common “vinyl over-laminate” or laminating films contain PVC. I have to use higher quality or shop around for polyester, but it is getting more common. I also prefer satin or “textured” – matte can get marred easily and gloss creates glare problems with museum lighting. Go with a company that specializes in large format printing, banners, and signs. No Kinkos, Staples, or other fast copy shops. If the print needs to last a long time ask the vendor whether it is guaranteed and for how long. Don’t use that company if they have no warranty period! Use outdoor-quality printing for long-term indoor applications. Ask for PVC-free everything – print, laminate, and substrates are available that do not contain PVC – there’s no excuse to use it… though some vendors may not be agreeable about that since PVC is cheaper and keeps costs lower. Again… shop around. So, that’s my advice about printing for indoor use – from experience. When you get into outdoor applications there is a whole other world of materials… so remember, none of this applies to exterior signage or outdoor panels! Plaid is a geometric and polychromatic pattern with a wide representation in North Carolina cultural heritage collections. Often associated with Scotland’s clans, some plaid in North Carolina collections relates to this portion of the state’s ethnic heritage. Our state boasts a museum devoted to plaid in Franklin—The Scottish Tartans Museum. 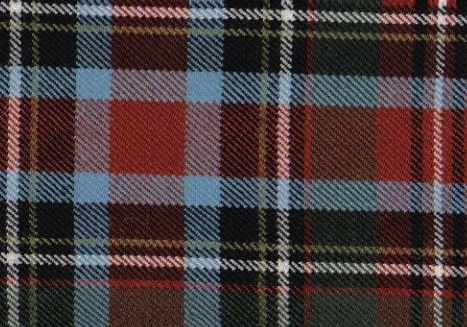 That institution’s website profiles the “Carolina Tartan,” which a Scot designed in 1981 and the NC legislature adopted as the official state tartan ten years later. 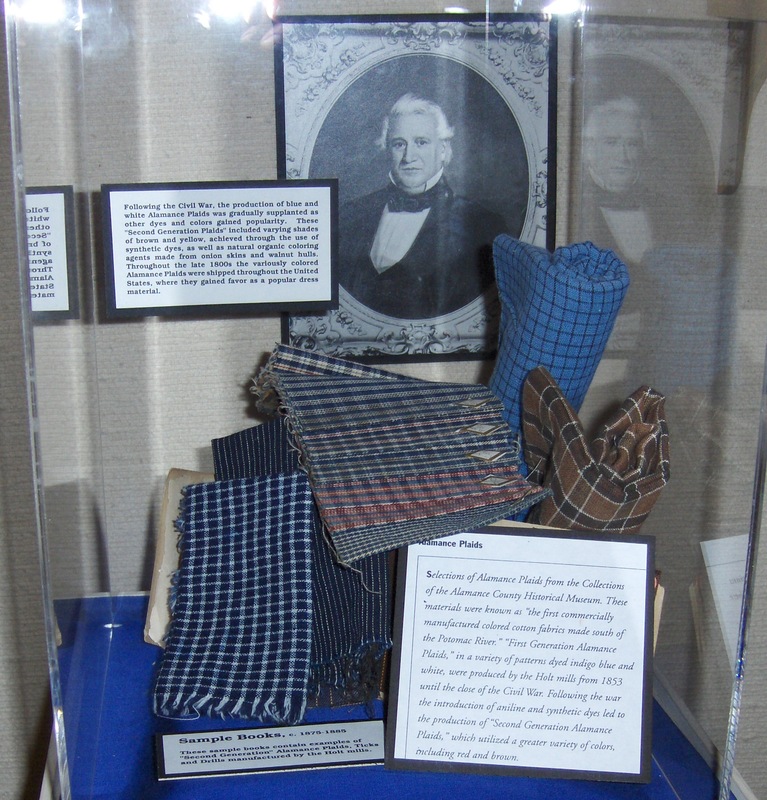 The Holt family’s Alamance County cotton mills began producing a blue and white plaid fabric in the 1850s and shipped their products by rail to a national market. 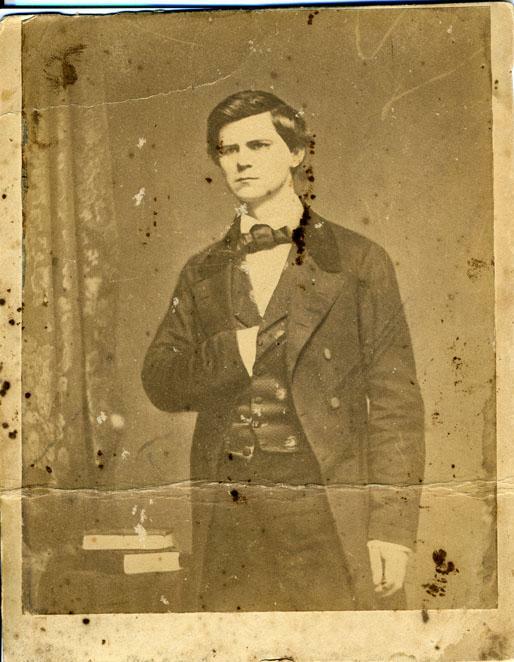 During the decades after the Civil War, Holt mills developed a wide variety of plaid patterns and color schemes. As the North Carolina textile industry developed, plaid became widely available. Practical for working clothes, its darker colors and patterns helped to conceal dirt. The popularity and brand recognition of Alamance plaid led to the expansion of Holts’ mills, with Plaid Street in Burlington, Alamance County, as an enduring vestige of the industry’s heyday. In addition to the Alamance County Historical Museum, several other Piedmont museums commemorate this history. The Textile Heritage Museum in Glencoe, Alamance County, and the Textile Heritage Center in Cooleemee, Davie County, are two examples. Plaid’s popularity and creative inspiration continues. One house in a downtown Raleigh neighborhood displays an expertly delineated plaid paint job. Maybe someone living on Plaid Street in Burlington will follow this lead. Does your institution’s collection include any interesting examples of plaid? Can those artifacts tell stories of Scots immigration, textile production, fashion, zany creativity, or something else? One of our blog subscribers, and founder of a non-profit, has generously contributed the following board development advice. Make room for new ideas and approaches. New recruits who hear “we’ve always done it this way” will give up, leaving you back where you started. Show new recruits your enthusiasm. You want them to see the best of what your organization can do, not a doom-and-gloom plea to save a sinking ship. If you’re discouraged, fake it. Sometimes affiliate board members feel so desperate that they will take any warm body who offers to be on the board. If you treat it like a task no one would want, you’re not going to attract the kind of people who are going to create an effective board. Work on your mindset; remind yourself of your institution’s mission and potential, and move forward with the thought that it’s an honor to be invited to serve on your board. Form a recruiting task force. Sit with your board and make a list of 20 well-connected people of the type you would love to have on your board but who you figure wouldn’t do it (but who might know someone who would). Call them and invite them to come to a single meeting. Tell them that you will be describing your institution’s mission, services and potential and what you’re looking for in board members. Assure them that at the end of the meeting they’ll be asked simply for the name of one person they think would be a good board member. For the meeting, prepare a short presentation about your institution and end with the funniest and/or most touching story you can come up with that will convey your enthusiasm. If you’re lucky, one of the guests might actually end up agreeing to be on the board. At minimum, you will walk away with the names of a bunch of potential board members. The next day call each one and start by telling them who nominated them. Post “Great Board Member Wanted” ad on free websites that match people seeking boards to join with nonprofits seeking board members. If your local community has a website with this type of service, try it. Swinging board members: Pick a few local non-profit organizations, preferably of a similar size to yours. Call and invite a leader to coffee with a couple of your board members and suggest that your two organizations recommend “retiring” board members to each other as a way of establishing organizational links and strengthening ties among communities. Our institution needs to improve and will benefit from your skills and contributions. You have the potential to effect change and have an impact. You will enjoy collaborating with interesting people who have the same values. You will be recognized for your efforts. Your board service will be a way to give back to the community. Our group interactions and/or institutional activities are fun! Numbers: Have enough people on your board so that all the jobs are getting done and no one person is shouldering too big a load. Skills: Look for board members who will complement your current board, not replicate the strengths you already have. Do you have these people? Have the ability to: listen, analyze, think clearly and creatively, work well with others. Are willing to: review agenda and supporting materials prior to board meetings; attend board meetings, serve on committees and offer to take on special assignments, ask questions, take responsibility and follow through on assignments, contribute personal and financial resources in a generous way according to circumstances, inform others about the organization. Will develop certain skills, such as: soliciting funds, identifying and recruiting board members, reading and understanding financial statements, learning about and staying up to date on museum issues. Possess: honesty, tolerance of differing views, a friendly, responsive, and patient approach, community-building skills, concern for your institution, a sense of humor. Have a couple of well known and respected community members on your board. They have good connections, are effective at spreading the word about what you do, and they will lend credibility. But, make sure they are willing to do a job as well, even if it’s only a small one. Be clear with new recruits that you have a working board; there are no figurehead positions. Even if you are thoroughly revamping your board, keep one or two long-term board members if you can. While some founding members can be being rigid and controlling, others are invaluable for their institutional knowledge and expertise. How much should we rely on introductory text panels in exhibits? As we’ve discussed earlier in this blog, if you don’t engage visitors at the beginning of the exhibit, they’re more likely to proceed through the whole thing with a continuing (and maybe growing) strain of museum fatigue. Objects have the power to raise questions and inspire imagination. But, if they’re buried inside too much interpretation (a common fault in history museums), that power is overwhelmed by pedantry. One blogger for TourSphere recently reported on an engaging exhibit experience where the museum did not provide much interpretation up front and instead allowed the artifacts to spark viewers’ curiosity. Read this account and think about how the design of your own exhibits facilitates curiosity and imagination or, rather, squelches these experiences from the get-go. A tangential point the TourSphere post addresses, and one with several several examples in North Carolina, is the way that metal detector hobbyists can be involved in uncovering cultural heritage. (Be sure to click on the “dude with a metal detector” link within the TourSphere blog for a great image.) Some North Carolina exhibits and the Office of State Archaeology (OSA) have benefitted from our local troop of “dudes with metal detectors.” Dr. William Purkey, for instance (pictured above with a detector) uncovered a significant Revolutionary War button during an OSA-led survey at the Alamance Battleground State Historic Site. Let’s create and/or revise history exhibits to allow artifacts to raise questions and give visitors a chance to participate in interpretations by inviting them to imagine meanings. This type of engagement is surely a part of what motivates treasure hunters like the Old North State Detectorists. There’s probably always space for an expertly written narrative of the past, but should viewing it always be mandatory? In the case of the National Geographic Museum, profiled on the TourSphere blog, visitors could opt into the narrative documentary. What other designs, media, or exhibitry techniques might forge exciting partnerships between visitor-imagined meanings and research and interpretation?